The Wimbledon Lawn Tennis Museum is the showcase for the world famous tennis club and its yearly championship simply known as Wimbledon. As any avid tennis fan will know the championships are considered one of the worlds's best sporting events of the year, attracting thousands of spectators and only the very best of the best tennis players. The club was founded in 1868 and has been at its current location since 1922. 2011 saw the marking of the clubs 125th yearly championship, surely one of the oldest remaining sporting events still held worldwide. The museum is situated within the grounds of the club meaning that you have to walk past impressive playing courts and stands as well as the famous centre court to reach it. This in itself is worth the admission charge if you are a tennis fan. 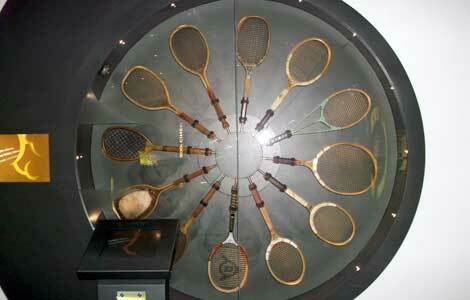 The Wimbledon Lawn Tennis Museum is open 10am to 5pm seven days a week. However due to events being held at the tennis club throughout the year between 18th June and 14th August the museum is only open to the public at certain times. Please check with the museum before you visit. The Wimbledon Lawn Tennis Museum has an impressive collection of over 15,000 tennis related objects which is far more than I thought actually existed. The items take you through the story of tennis from its early beginnings as a pastime for the middle and upper classes to today's world elite sports men and women. The earliest objects on display date back to 1555 showing how tennis as a sport and hobby has been a part of England's heritage for many hundreds of years. It is as English as strawberries and cream and tea and scones and the items on display reflect that Englishness and how it has woven itself into the hearts and minds of people for many generations. Trophies and Medals - Including the famous Wimbledon cup and plate. Fashion - From the earliest full length heavy dresses from the early 1900's to today's modern fabrics and designs. Many of the items of clothing on display belonged to some of the legendary tennis players of recent times, including Venus Williams and Martina Navratilova. Tennis Equipment - From the very earliest rackets to the latest in up to date technology in racket design. Jewellery - Jewellery for both men and women with a tennis motif. 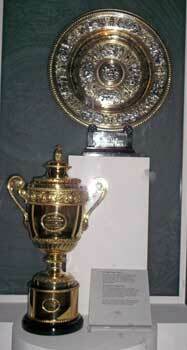 Player Memorabilia - Personal items collected from the tennis stars of yesteryear to the present. 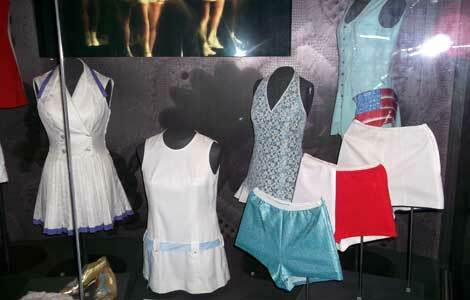 The collection includes costume, bags and signed items from some of the biggest tennis players from around the world. Decorative Art - As tennis became more and more popular so it found itself being included in design from the late nineteenth century. items include, ceramics, glass and metal work. Beautiful art deco figurines can also be seen. Fine Art - paintings, sculpture, cartoons and photographs. Toys - tennis dolls, action figures, soft toys and board games. Olympics - Medals, programmes, clothing and archive material associated with the history of tennis within the Olympic movement. Ephemera - advertisements, packaging, tickets and programmes. Included in the price of your Wimbledon Lawn Tennis museum ticket is the chance to visit the centre court. A wonderful 360 panoramic viewing stand has been erected within the centre court. Allowing you to be taken right inside the stadium area and really get a sense of the atmosphere of the court. I was quite excited to be visiting the Wimbledon Lawn tennis Museum as I had always wanted to see the famous tennis courts for myself. Every year since I was a small child I had watched the Wimbledon championships on the television and witnessed the excitement they generated. I never thought I would ever get so close to the real place myself. The Wimbledon Lawn tennis Club is a little way out of the main centre of town but easy enough to walk to. You are greeted at the main gates my a friendly security guard who will ask to see your bags etc, he will then direct you across the courtyard to the museum entrance. The Wimbledon Lawn Tennis museum is set within its own building and as you enter you find yourself within the shop for the museum. After paying the admission fees (remember London Pass holders get a guided tour for free), you are directed down some stairs into the main museum. The museum layout is rather intriguing. 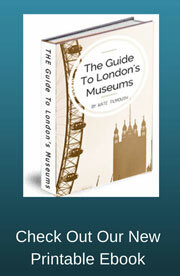 It is designed like a large donut, whereby you walk around the museum and end up in the same place that you started from. This was unusual but very appealing, it meant that you could easily re visit early parts of the museum again if you wished, or like me go round the whole thing again. I would describe the museum as medium in size, big enough to capture your interest and display many different kinds of items, but small enough to feel overwhelmed. 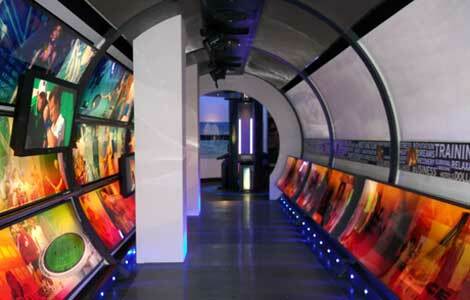 It is a very modern museum, with innovative moving displays, video screens, light boxes and interactive areas. Sounds a bit over the top doesn't it but it really wasn't. I was so pleased to see that a lot of thought had been put into making the displays both interesting and easy to access without being bombarded with information. Near the end of the museum you come across the museums latest display, a 3D holographic John McEnroe. It is difficult to explain but it really was so innovative and different. You look into a real room which is a mock up of the changing rooms which John McEnroe would have used when he played there. All of a sudden John McEnroe walks in and starts to interact with the items in the room and also gives a commentary of the matches he played there which is supported with video footage of his matches. This is a popular display and you may have to wait a few minutes to get to the front to get a good view when the museum is busy. But it is well worth the wait. I don't know how it's done but it looks very realistic. As usual after visiting the museum I paid a visit to the cafe for some Lunch. It is a fairly basic cafe but very pleasant and the food is simply and not too pricey. I ate a delicious jacket potato with cheese, egg mayonnaise and salad for £4.70. Before you leave the cafe there is one last treat not to be missed. A door marked 360 centres takes you from the cafe, down a tunnel and straight into a glass hexagonal viewing platform right into the centre court. I hadn't expected this at all and I was really thrilled. The platform is down close to the actual court and the seating is all around you, you really are at the heart of things at Wimbledon's main centre court where all the finals of the championships are played. This for me was the best bit and you could really sense the excitement this court had seen over the years. For me this experience was well worth the admission price alone.